With the various coaching moves and NFL decisions all starting to fall into place it’s time to take my initial look at the Big 12 for 2017. Most of the big moves suggest a lot of positive continuity for the league save of course for at Texas and Baylor, who snagged two of the more successful and physical-ball oriented coaches in college football’s head coaching minor leagues (the AAC). I’m going to give a brief overview of what teams are looking like for 2017, with my own notes and starting assumptions as we head towards national signing day and the offseason. We’ll go from first to last in terms of 2016 finishes and start today with 1-5. I initially wasn’t sure what to make of the release of Joe Mixon’s video in terms of his decision about going pro but I saw Max Olson of ESPN argue that releasing the video pointed to him leaving for the NFL and trying to get out and ahead of that story well before the draft. That makes the most sense to me. I’m sure Perine is gone as well, there’s little sense in sticking around to take more hits in college for considerably less money, especially when you’re already the record holder for most yardage as a Sooner RB. So the Cerberus backfield is gone, thank God. 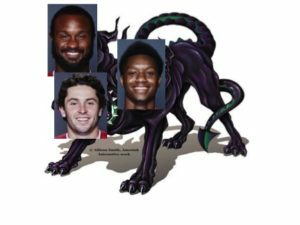 The Sooners are also losing Dede Westbrook, who was a truly explosive weapon and somehow a Heisman finalist (it pays to work against people distracted by Cerberus) and the guts of their defense. Nose tackle Jordan Wade, inside-backer Jordan Evans, and free safety Ahmad Thomas are all gone. They’ll probably feel the loss of Evans most keenly since Thomas and Wade were solid but nothing amazing and they have other guys rising up in the program at those spots. They’re also losing star DE/DT Charles Walker, who was hurt during the year and shut it down to prepare for the NFL. Baker Mayfield and Lincoln Riley both appear to be returning to Norman next season, which all but guarantees that Oklahoma has a fearsome offense against next season. Additionally, while I think both Mixon and Perine were unique and special backs, the Sooners are bringing back FB Dmitri Flowers and all five starting OL, including potential future pro LT Orlando Brown. I was a fan of Abdul Adams coming out of high school and I’m definitely a fan of anyone playing next to Mayfield and behind these blockers. Whoever wins the starting RB job at OU next year is a virtual lock to run for 1k yards. On the edges they’re getting back weak OLB Obo Okoronkwo while returning highly promising strong OLB Caleb Kelly to potentially fulfill the Eric Striker role. Nickel OLB Will Johnson is back, as is lockdown corner Jordan Thomas, cover safety Steven Parker, and the large cast of corners who tried to fill slot no. 2 for their secondary last year. I think the OU offense is going to be very similar to what we saw from them in 2016. Many of the key players are back, although presumably they don’t have another feature back/WR hybrid on the roster like Mixon but they’ll likely just mix in more conventional spread sets with a FB or fourth WR. Flex TE Mark Andrews is back and can line up on the LOS to help create a free release for incoming JUCO Marquise Brown, a 5-11, 170 blur who seems a mortal lock to carry on the tradition of impossibly quick, small receivers that runs back to Ryan Broyles. Seriously, from 2009-2016 OU has always had at least one speedy little burner at wideout to torment the league. From 2009-11 it was Broyles, in 2012-13 it was mostly Jalen Saunders, in 2014-15 Sterling Shepard held the belt, Dede Westbrook took it in 2016. Brown will likely hold it in 2017. On defense they look like they should be significantly improved on the edge but if I were a Sooner fan I’d be very worried about their ability to lock down the middle of the field. The DL should be fine, Amani Bledsoe and Neville Gallimore got some useful snaps this year and the latter looks like a future star. However, it takes a ton of experience and know how to play linebacker or safety in the Big 12 without getting ripped for assignment busts, minor false steps, or just getting outmatched athletically. Oklahoma might be in good shape at safety with Parker, Johnson, and up and comers like Will Haughton back but ILB looks like a potential sore spot. I figured Oklahoma State was about to have a hammer dropped on their 2017 prognosis in the form of major departures to the NFL combined with graduations across the defense. They are losing a ton, but retain their engine, but more on that in a moment. The biggest loss is DT Vincent Taylor and not just because he was a great player but because it’s so dang hard to find great DTs in the Big 12 and convince them to come to places like Oklahoma State. Of course when you do they just leave after their junior seasons because they are as much in demand in the NFL as they are in college. His partner up front Motekiai Maile is also graduating. Behind them the Cowboys are losing sam and will linebackers Devante Averette and Jordan Burton as well as star free safety Jordan Sterns. Cornerback Ashton Lampkin is also gone. This defense is basically getting wiped out. However, I’m sure they have tons of guys who have been redshirted and developed over the last few years to step into these roles and their DE position was starting to look pretty good by the end of 2016. I imagine Glenn Spencer can probably build another fairly solid unit if perhaps nothing amazing (unless someone emerges in a big way). On offense the Cowboys are losing a bunch of running backs that were all jumped by freshman Justice Hill anyways, some OL that were alright, but then also their “Cowboy” backs. Hammer-back Zac Veatch is gone and so is motion-back/flex TE Blake Jarwin. These guys were immensely valuable in Oklahoma State’s “pro-style spread” offense last year and replacing them will be an important step this offseason. Fortunately they have a coach dedicated specifically to that purpose in Jason McEndoo. Mason Rudolph is back with receivers James Washington and Jalen McCleskey, who of course was the winner of the 2016 Darren Sproles water bug trophy for most outstanding tiny person. So, Oklahoma State is a virtual lock to have a deadly passing game that most of the league can only hope to contain. Since RB Justice Hill is also back they know exactly what they’ll be looking for from their role players this offseason, which is a huge boon for offseason development. There’s a massive difference between looking for the next cornerstones of the program and building on a solid foundation. Defensive continuity can only be found in the constant development that takes place in their system with their habit for redshirting. DEs Cole Walterscheid and Tralund Webber were playing pretty well by the end of the year and Spencer was experimenting with some 3-3-5 sets that were pretty useful for the Cowboys. I’m sure Kenneth Edison-McGruder, Justin Phillips, and Darrion Daniels will all make the necessary leaps to figure prominently next season. The Cowboys will likely look very similar on offense, provided they are successful in finding another hammer-back to replace Veatch, and will torch opponents with their RPOs and drop back passing game. Mason Rudolph is a dangerous man and he has a ton of scary weapons that he’s very familiar with in his holster. I think their defensive identity will likely be the same as well, they’re too committed to the 4-2-5 and have too many solid young DTs to go all-in on a 3-3-5 so they’ll continue to be multiple and sound and hope to make enough stops or turnovers to win shootouts. West Virginia is losing starting QB Skyler Howard, a onetime JUCO transfer they took a flyer on, Howard proved more adept at handling their offense than anyone else on campus and held down the job for almost three seasons. They’re also losing some of their key players up front in nose tackle Darrien Howard, DE Christian Brown, and sam LB Justin Arndt. Their biggest losses are at CB where just about everyone is gone. Rasul Douglas, Maurice Fleming, the main back-ups. Gone. They’re also losing some of their best OL in OT/OG Adam Pankey and OC/key Holgorsen restrainer Tyler Orlovsky. It’s not so much what West Virginia returns from 2016 that’s intriguing, although they do return all of their top skill players except tough and reliable slot Daikiel Shorts, it’s what they they had sitting on their bench that now gets to step in or back into action. For starters, Florida QB and transfer Will Grier spent last season running the scout team and learning the Air Raid and reports out of practice suggested that he was the best signal-caller on campus. Holgorsen likes to run an RPO-heavy spread-I concept that still has a major influence on Oklahoma St’s offense and adding an accurate and dangerous pocket passer to the mix makes their offense potentially more scary in 2017 then they were in 2016. Young LT Yodney Cajuste is also back, after missing much of 2016 with injury and their young RT Colton McKivitz also returns, which should help as they seek to feature their less mobile but more accurate new QB. Joe Wickline is around to make sure they drill their up and coming OL into overachieving zone blockers and FB Elijah Wellman is back to add some extra pop to their RPOs and run game so there’s a very good chance the offense goes from “solid” to “very good” in 2016. Another guy that spent 2016 on the bench was FS Dravon Askew-Henry, who flashed a ton of potential as a young DB and then missed all of last year with a camp injury. With Henry, 2/3 of the LB corps, and spur safety Kyzir White back the Mountaineers are looking pretty solid in the middle of their defensive backfield. We should also note that it was hardly a guarantee that Dana Holgorsen or Tony Gibson would be back, in fact this time last year I would have bet against it, but both were locked down with long-term deals. That’s huge for overall continuity. It should be more of the same on offense although they’ll look more like they did when Clint Trickett was shaking off cobwebs and chucking deep to Kevin White then when they were running WR bubble/QB counter RPOs to feature Skyler Howard’s 4.8 speed. I think they’ll probably be pretty good here with Shelton Gibson, KeRaun White, Jovon Durante, and Justin Crawford all back. They need to do some work on their interior OL but still have Michigan transfer Kyle Bosch back for one more go. The defensive identity should be pretty consistent as well, although they’ll probably be better up the middle with an improving interior-5 and perhaps iffy on the outside with all of their corners gone. Their biggest question will be whether they can find guys that can hold up on the blitz outside when they want to bring pressure. Per S&P, K-State finished the year just behind WVU as the best defense in the Big 12. I’m a little suspicious of S&P’s ability to compare B12 defenses to defenses from other conferences, but not as much on its ability to compare units within the league which is partly why I named Rasul Douglas my DPOY and not K-State DE Jordan Willis. Either way, like Douglas, Willis is leaving after this season. SS Dante Barnett is also gone, although his senior season was not as impressive as the junior campaign he put together in 2014 before the injury that cost him virtually all of 2015. K-State also loses MLB Mike Moore, who was one of their typical “always around the ball” scrappers, and nickel/CB Donnie Starks who was improbably involved in one of the funnier on the field incidents of 2016. On offense K-State is losing senior WR Deante Burton and scrappy RG Terrale Jones, who combined with RT Dalton Risner to be the main thrust of their run game last season. That’s it. K-State is returning everyone else. K-State’s young OL ended up playing pretty well down the stretch in 2016, particularly once QB Jesse Ertz got fully comfortable (and healthy) with the run game. What’s more, they started the year with redshirt freshman Tyler Mitchell at LG and then replaced him with talented JUCO transfer Abdul Beecham who had finally become used to playing there after playing tackle in HS and in junior college. Then Beecham got hurt and Mitchell stepped back in and played pretty well. All that to say, K-State basically returns five starters along the OL and need only to sort out where they like Beecham and Mitchell in terms of left or right guard. I’m guessing they move Beecham to the right side to combo with Risner. FB Winston Dimel is back, as are the better RBs of 2016 (Alex Barnes and Justin Silmon), and Ertz’s two favorite targets Byron Pringle and Dominique Heath are also back. On top of that, K-State adds Cal transfer and DFW recruiting star Carlos Strickland, a 6-4 WR. Ertz proved himself to be a classic K-State QB this past season, running for 1k yards while demonstrating just enough competency in the passing game to constrain defenses. He’ll probably continue to improve in the latter area, as well as in handling K-State’s audible/check heavy play-calling, and allow the full Snyder playbook to go full “kitchen sink” mode. The defense returns star LB Elijah Lee, who was athletic enough to handle all of the space that K-State tends to put their OLB in, which shores up a major need within this defense. They found new CB DJ Reed to be quite solid last year and he’s back with lockdown corner Duke Shelley. Cre Moore is a program guy that knows the deal and is back at nickel while FS Kendall Adams is a potential star. The DL returns star freshman Reggie Walker, nose tackle Will Geary (yep, still one more year of eligibility), and young DT Trey Dishon. Walker will likely be relied on to replace Jordan Willis’ pass-rush while one of two seniors Tanner Wood or Davis Clark works opposite him. I imagine everyone is expecting Elijah Sullivan or Sam Sizelove to take over at inside-backer but my money is on former walk-on Trent Tanking, who’s always been really solid in back-up duty. I’ll also venture to guess that Sean Newlan takes Kendall Adams’ job at FS while Adams slides over to replace Dante Barnett. That’s a slower safety tandem then a year ago but also a much more experienced one and that’s what Snyder prizes above all else. The offense will be typical K-State, but closer to what they were capable of with Collin Klein than what they were with Jake Waters. If the passing game makes a big leap this team could even be the best offense in the Big 12, as amazing as that sounds. They’ll also be better insured against injury to QB Jesse Ertz with Joe Hubener still around but young guns Alex Delton and Skylar Thompson now more acclimated to Snyder-ball. The defense will continue to be a bend don’t break unit that perhaps mixes in less blitzing unless Adams proves to be capable in man coverage in Barnett’s spot. They’ll be solid overall but they could be great if their corners and nickel improve and allow Newlan and Adams to ballhawk from deep and their pass-rush stays effective enough to prevent teams from getting after them. This is a much more experienced team overall then they’ve been the last few years and that’s everything in Snyder-ball. Foster Sawyer’s decision to transfer isn’t necessarily a huge loss for the Horned Frogs, but it is indicative of how things look for their QB competition heading into next season, but more on that in our next section. TCU is also losing senior DL Aaron Curry (DT) and James McFarland (DE) both of whom were very solid but neither of whom were spectacular or irreplaceable. That’s it. TCU is bringing back almost everything from this team. Does the return of Kenny Hill count here? The former A&M transfer’s performance against Georgia was pretty typical of his entire season. He threw 27 passes for only 146 yards (5.4 ypa) while avoiding either interceptions or many explosive plays and got sacked five times for 29 lost yards. He also ran the ball 12 times for 101 yards, which was just about the only really good thing TCU had going on offense other than Kavontae Turpin kick returns. Hill and most of the WRs are back, particularly Turpin, who’s probably the most crucial element to this team. Outside receivers Taj Williams, Jaelan Austin, and John Diarse all flashed at various points in the year but the Frogs didn’t have any ISO guys that could command particular attention from defenses or be go-to options in crucial moments. The Frogs also return most of a solid OL and a very solid RB in Kyle Hicks. Tons and tons of very capable players all across the lineup but they need to find some standouts in 2017 to stand out in an offensive-oriented league. Or…they could roll the dice with this guy, who arrives in spring and may be the reason that Sawyer is transferring. On defense, TCU returns nearly every positive attribute to their squad. In 2015 they found converted CB Nick Orr gave them a lot of coverage flexibility on the back end and they translated that into a superior fire zone blitz package in 2016. They also developed LB Travin Howard and CB Julius Lewis who also return for 2017. In 2016 they found JUCO DE Mat Boesen to be a valuable addition both as a pass-rusher and as a guy that can make coverage drops on zone blitzes, Ty Summers emerged as one of the better inside-backers in the league, Ridwan Issahaku proved he could replace Denzel Johnson at strong safety, and Ranthony Texada started to round back into form. This team will have a ton of experience in the secondary and a much better chance at the kind of CB play I thought they might get in 2016. Their DL will include some of the better pass-rushers from 2016 and there are lots of solid guys at DT coming back…this is probably the best defense in the league next season although the competition for that honor should be stiffer. TCU has to be a great defensive team that turns the ball over in 2017 to have a chance at contending for the league crown with OU, OSU, and KSU all returning good QBs to lead already strong teams. If they can force lots of turnovers, that gives them a chance to be unique and hold an advantage over the competition. Their identity on offense is another question entirely. I imagine they’ll continue to roll with Kenny Hill since he really wasn’t too bad so long as he was avoiding INTs and he added a lot to their run game. 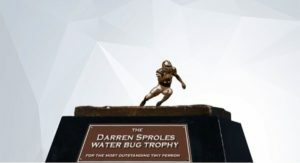 Being able to turn the clock to #TurpinTime ought to help a great deal as well and a strong TCU season almost necessarily includes Turpin seizing the Darren Sproles water bug trophy for most outstanding tiny person away from Jalen McCleskey’s small but vice-like grip. They could try to focus more on their run game this offseason in lieu of lacking a dominant weapon outside the hash marks and that would set them up to transition to the Shawn Robinson era. We’ll see, I think if Sonny Cumbie’s voice is loud enough that’s what will happen. The likeliest alternative is that one of these outside WRs makes a leap along with Kenny Hill to allow them to continue to emphasize the passing game. Next up will hit teams 6-10 and I’ll offer up power rankings on how I currently view the league heading into 2017. Very excited to see the Will Grier era kick off. Guys like Gibson and Durante should see catchall balls a lot more often next year. I’m encouraged to see they’ve only gone after one Juno lineman, Wickline son, in recruiting. That makes me think they like the possible replacements on the line. Really worried about the Dline and corners but with what they have coming back at LB (including Brendan Ferns!) and safety the defense should be able to hold steady. The LB core I’m particular should be much more athletic. Some combo of White, Ferns and Xavier Preston (roughly 6’2, 230-240) should give them a better outside pass rush than they had this year. Might be a long time before WVU starts a CB they recruited out of high school again. Ugh. That should be catchable and JuCo. There’s an I’m that should be an in too. Not my best effort. I forgot about ferns, I guess he replaces Arndt, who I was a big fan of. Long and the other guy inside I thought were pretty solid. I’m guessing they’re loading up on JUCO corners? You know, looking over the roster, it looks like I overstated the JuCo corner thing. Elijah Battle and Mike Daniels are the only JuCo guys CBs currently on the roster that I see. And although I expect them to start, that leaves the window open for younger guys. Still, I expect a grad transfer and they have another JuCo CB committed for this year (not sure if he is ready to play for 2017 though, even Douglas wasn’t. I hope you do a run down of Big 12 recruiting classes again this year, that was great last year.). I suppose it is possible the Adams twins play this year, but I doubt either one starts. Arndt was great this year but at times, especially against OU but more generally when pass rushing, his limited size and athleticism (former walk-on) held him back even when he was in the right position. I doubt they replace him with anyone as football smart as he is but a guy like Ferns or Preston has 25 pounds and 3 inches on him with better speed. Definitely doing the class breakdowns again, need to start working on that again soon. I thought the best thing about Arndt was his change of direction and relentless motor to the ball. Dude made a ton of tackles just by being a dog and always chasing the ball. Hopefully for y’alls sake Gibson will have some of the younger kids up to snuff in his coverages and techniques. I think his playbook is extensive enough that he’ll have enough to work with to make for a good unit. Especially if they get better play up front this year. Honestly, Jordan Evans was almost more of a liability than a productive LB for the first half of this season. After the Texas Tech game, he really turned around and became what we all hoped he would be. He will be missed. However, having Beal back for a second year should help offset whatever inexperience may fill Evan’s void. My hope is that former 5 star recruit Ricky DeBerry is moved inside. He has to be ready to contribute, and it doesn’t look like he’s gonna crack the OLB starting spot anytime soon. Besides, he always struck me as a ILB body type. I think Beal is alright at inside-backer and could be valuable next year. But it’s a position that gets attacked with complexity, false keys, tempo, and space every week in the Big 12. If you aren’t a really fast thinker you need a ton of experience to master the position and I just don’t see guys on the OU roster who have been groomed over multiple years in the program to step in and fill that role.